Will Rebearth Save Us From Fall Army Worms? As we welcome the raining season, most maize farmers in the country will be on tenterhooks, wondering if the dreaded Fall Army Worms will come to visit again. If they do, is there any hope? It does seem that there is some glimmer of hope on the horizon as a Dutch company, Rebearth, is promising an end to the destruction that these pests have caused to farms in the past. The managing director of the company, Kees de Vries has even promised to test the product in Ghana for farmers to see because “seeing is believing!” He said the company has test materials available with a very simple procedure which involves spraying three times per growing season, on whatever form of farm. Rebearth sources describe Fall Army Worm (FAW) as an insect from the Americas that has since 2016 attacked farms in Africa and parts of Asia. 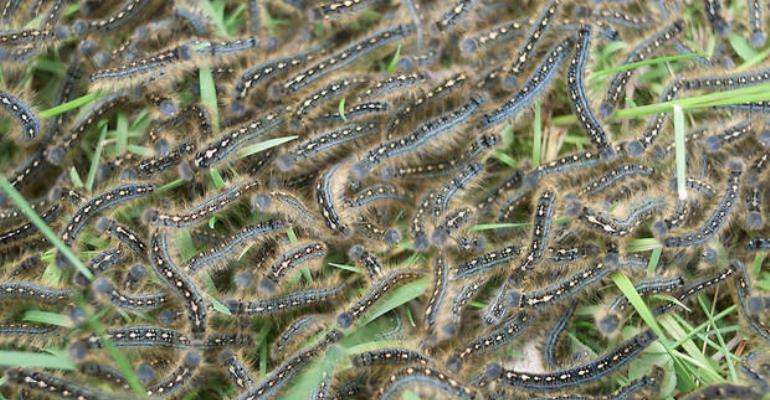 Its larvae can cause significant damage to crops, mainly maize. It said infested fields show damages from 26 – 50 percent, and in extreme cases, even total loss overnight is often seen. As a cure to this attacks, Rebearth’s safety is not in doubt because the European Union (EU), has certified it to be “absolutely harmless, safe and effective,” and is acceptable in organic farming. The use of Rebearth in conventional and biological agricultural practices in Europe is authorized under Regulation (EEC) No 2092/91 (Council Regulation (EEC) No 2092/91 of 24 June 1991 on organic) and by article 21.2 of Council Regulation (EC) No 834/2007 (Council Regulation (EC) No 834/2007 - EUR-Lex - Europa EU) . Rebearth also complies with Council Directive 98/83/EC dated 3 November 1998 (EUR-Lex - 32007R0834 - EN - EUR-Lex - Europa EU), which forms part of Regulation (EEC) No 2092/91 and Council Regulation (EC) No 834/2007. The Public Relations Officer of the Ministry of Food and Agriculture, Bagbara Tanko, has said in a statement that, FAW was first reported in the Yilo Krobo district of the Eastern Region in 2016. Last year, stakeholders together with the Centre for Agriculture Biosciences International (CABI) developed a short to medium and long term plan for managing the pest. It does look that not much has come out of these efforts. For this reason, it would not be a bad idea if the ministry starts looking at Rebearth, which is a transparent, natural and safe liquid that seeds are soaked in, before seeding, or sprayed on plants and soil during the growing season. “These tests were done at random in 2018. This year, 2019, we will do extensive testing and photographing and filming in how these things happen, to give it a broader basis. In the fields where Rebearth was sprayed from seeding no FAW was seen on the treated plots,” he said. Asked to show proof of the effectiveness of the product, de Vries said, there is anecdotal evidence so far. In southern Kenya, groups of smallholder farmers used Rebearth in 2018. “The doubling of the maize yield and the absence of FAW made them take the decision to use it again in 2019. Some NGO's in the same region promote Rebearth among their farmers. They have seen the results and are actively spreading the news,” he said. Rebearth, de Vries said, stimulates plants to optimize potency of their DNA, explaining that, “for traditional seeds, we see in many cases two cobs per stalk instead of one. In cases of FAW, the plant is armed with energy to produce chemical compounds that are able to fight FAW on their own”. He said the extra yield Rebearth generates, pays many times the cost of the product, even without subsidies. Our current focus is on the poorest farmers in Africa. For them, it is bridging the hunger period and taking away many pains of climate change problems like drought, heat, flooding, cold weather, etc. Rebearth, de Vries says, approaches the problem from a different angle. It supports and stimulates natural plant systems to combat environmental challenges on their own. “We give the plant its strength back, to react in its own way, even if the fertilizer situation is poor. This way of working also strengthens the plant to be more resistant to heat, drought, cold, drowning, and many other climatic problems and pests. In many cases it increases crop yield,” he added.